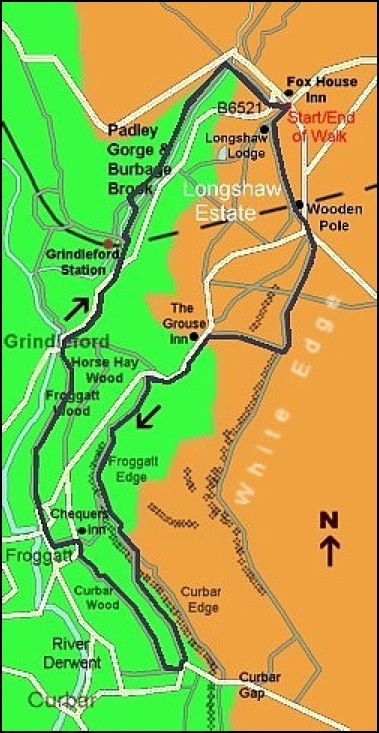 White Edge, Froggat Edge Curbar Edge and return to Fox House Inn via Grindleford and Padley Gorge. 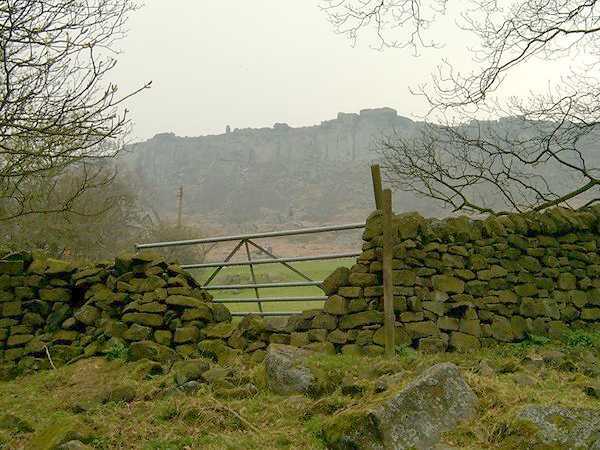 We were again starting a walk from the Fox House Inn on the Sheffield to Hathersage Road on what promised to be a cooler day than the previous one when we did our Stanage Walk. 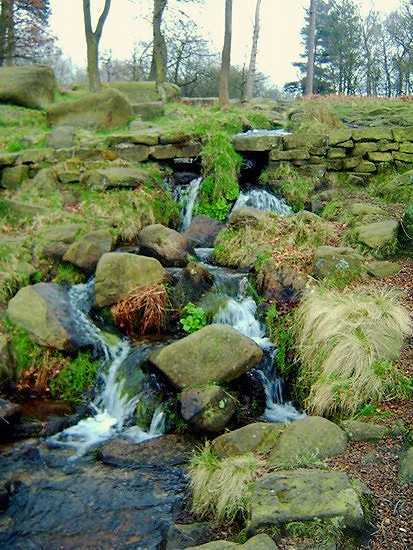 Having crossed the road we entered the Longshaw Estate near to its visitors' car park and walked towards Longshaw Lodge. However, rather than walk in front of the lodge, just before we reached it, we took a track to the left and went slightly east of south, initially through the woodland. Then, having passed through a gate, we reached a wide track with views over the valley to our right and hillside to our left. It was about 10.30 a.m. but already people were about enjoying the beauty of this area. 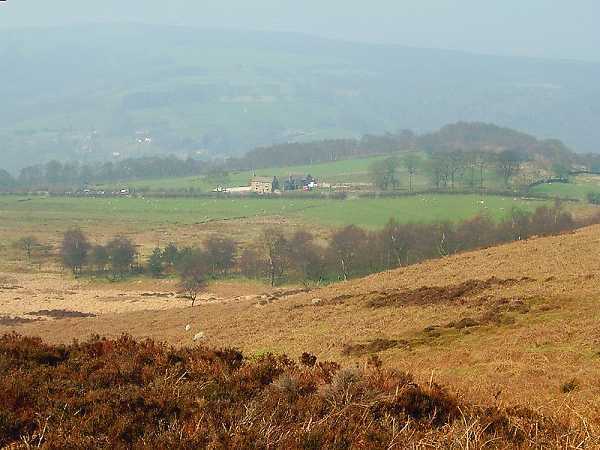 the Longshaw Estate towards White Edge. About a ¼ mile along this track there is a fork. 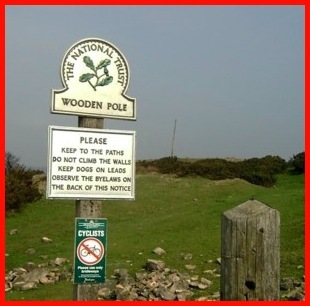 Our way was left and soon on our left we could see a wooden pole and shortly afterwards, where our track met the road, a sign stating that the Wooden Pole belonged to the National Trust. What is it all about? Have a read at this thread from the SheffieldForum.co.uk!! Pole, which is not the short thick one, but the long thin one in the distance. 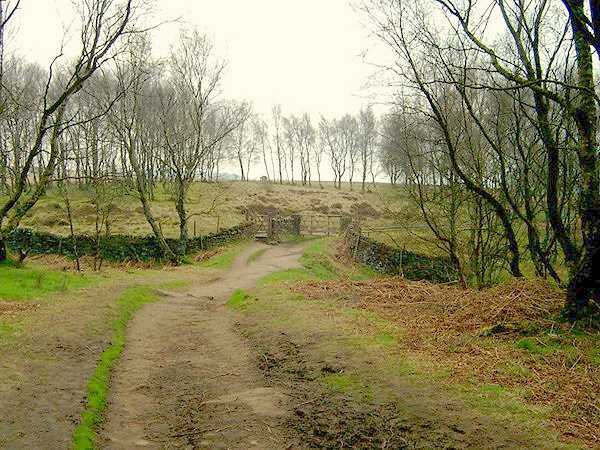 Leaving the Longshaw Estate we crossed the road – there is a meeting of three roads at this point – and took the path, to the left of a white gate for White Edge Moor. White Edge Moor is covered with peat and gets very boggy. 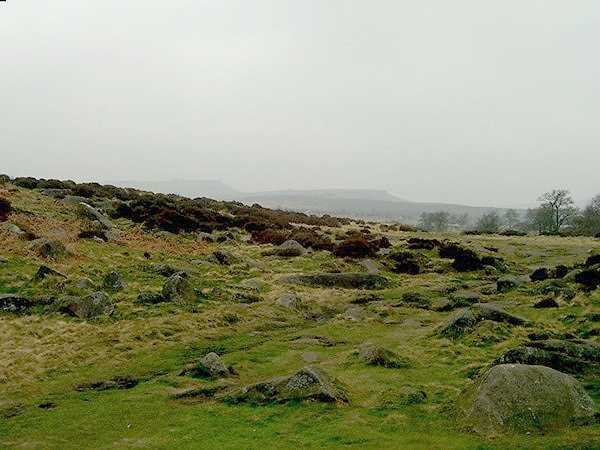 This soon become evident when, after the initial ascent, we walked over the flat top of this area on the path, which is some distance from its western edge of this moor. However, the land becomes more stable when the path returns to the edge. 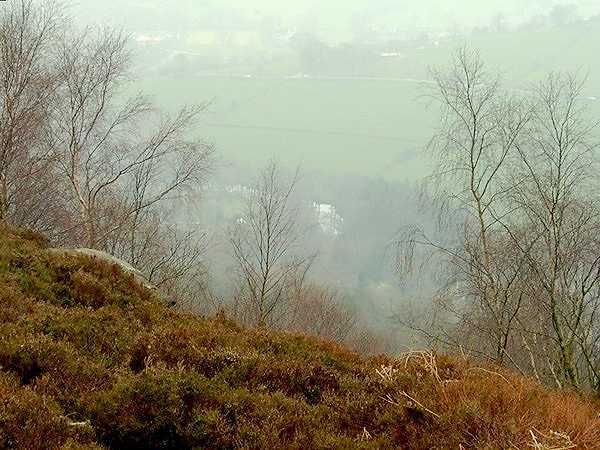 Here good views can be enjoyed looking southwards and downhill towards the Grouse Inn and the hillside beyond, on the west side of the Derwent Valley. We had considered walking all the way along White Edge to Curbar Gap but, as we had done it before, and I’d also walked White Edge with the “Boys”, we decided that we should have variety. 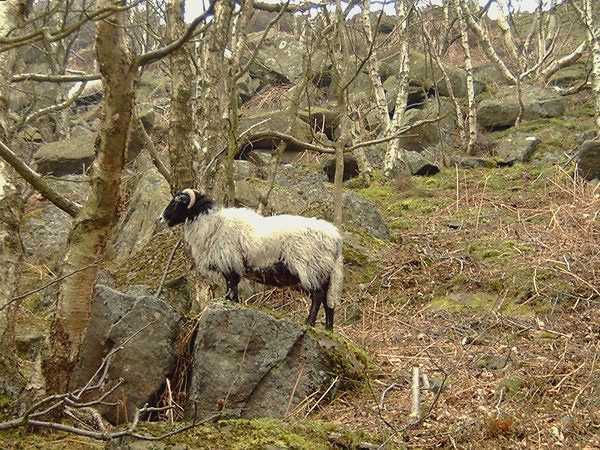 So at the 2nd westerly exit of White Edge we left this moorland and went downhill towards the Grouse Inn, via woodland and a meadow where Anne and I enjoyed watching the lambs having their Sunday morning frolics. 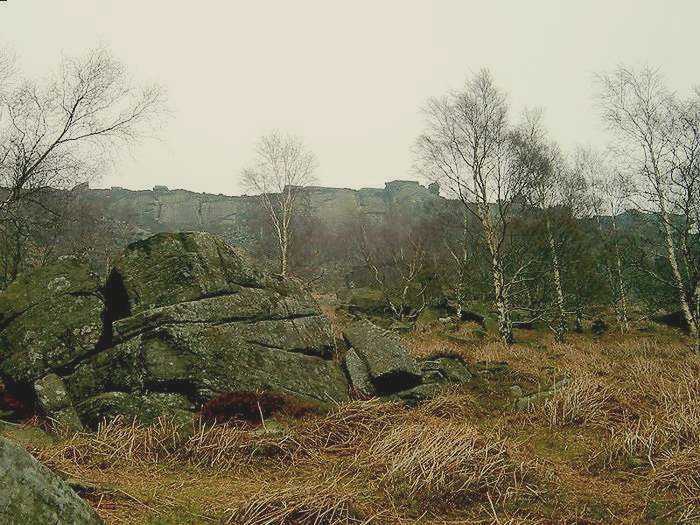 It was about 11.30 a.m. as we passed the Grouse and headed the ¼ mile south along the road before turning left onto Froggatt Edge. 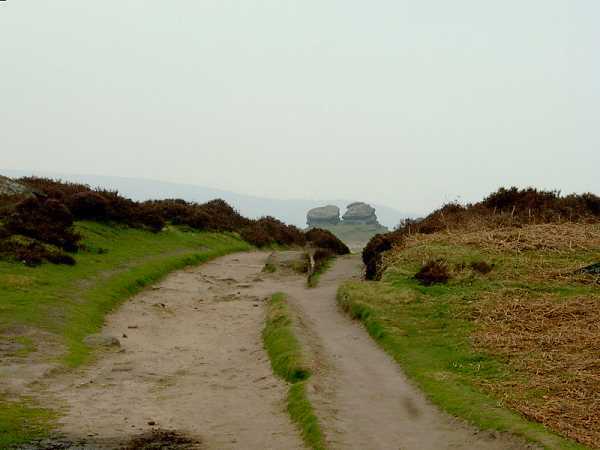 A view along White Edge - Note the two walkers to the left of the photograph. 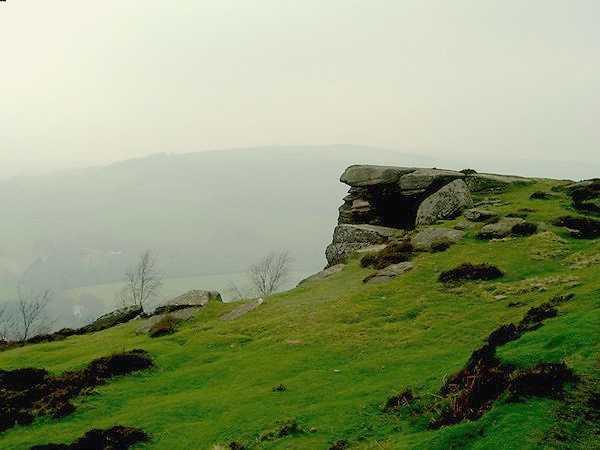 Froggatt Edge, in many respect, was like being on a lower terrace with White Edge being the higher terrace to our left (east). 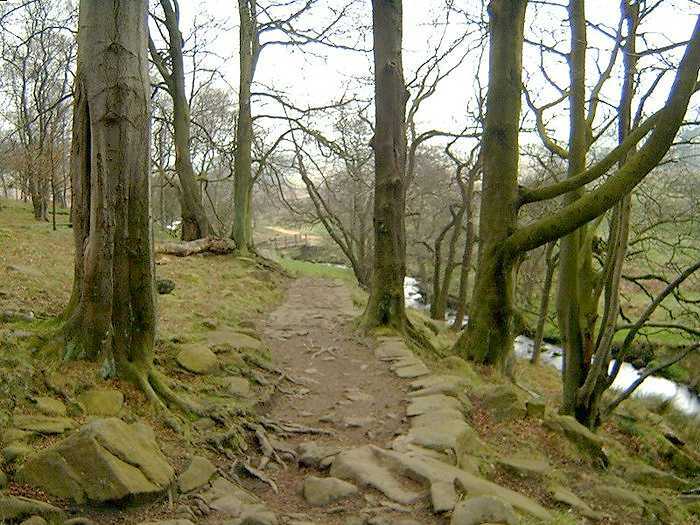 The path here was wide, dry and quite sandy compared with the peaty bogginess of White Edge. 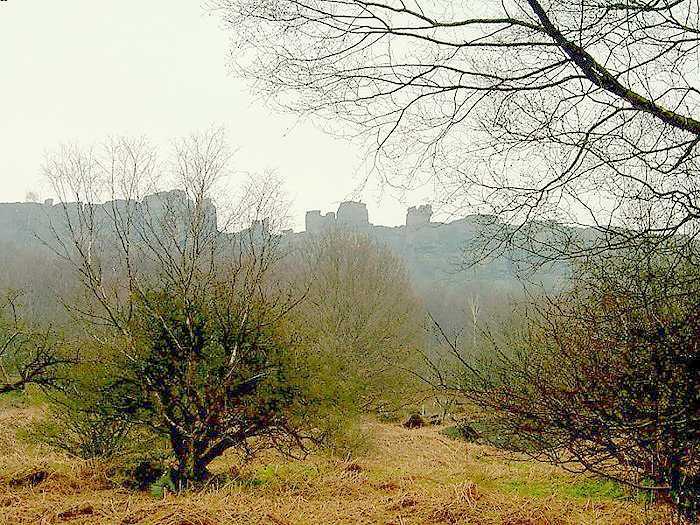 Initially we walked through birch woodland – the vast majority of the trees we would see today would be birch – before trees were replaced by rocks and downhill views to the west were with us once again. 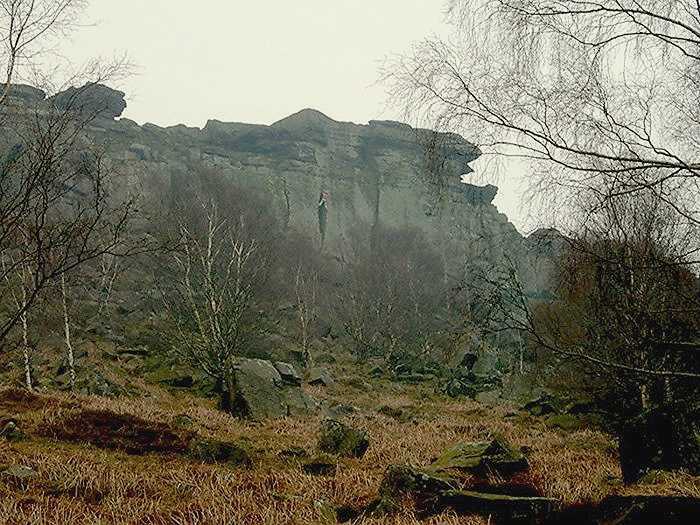 Just as Froggatt Edge becomes Curbar Edge there is a pathway going off to the right, downhill and southwards, which passes below the craggy face of Curbar. This was our route today, and a path I had not used before. But what a pleasant one it was. As it gradually descended through trees we occasionally disturbed the odd sheep foraging for food and, where the trees were less dense, we were able to see the buttresses of Curbar and climbers practicing there techniques on them. 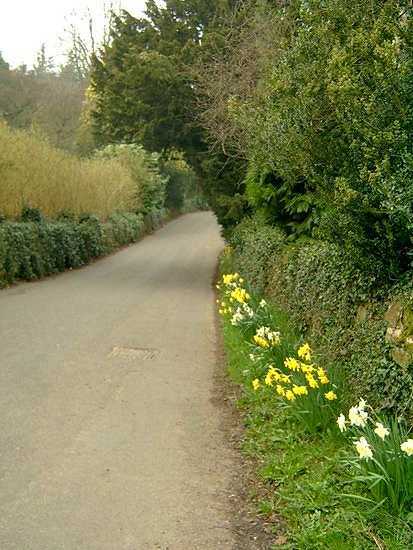 However, it didn't seem very long before we reached the road between the village of Curbar and Curbar Gap. From here we walked down the road a 100 yards or so before we turned right and took a path northwards, which was below and almost parallel with the path we had left a few minutes previously. 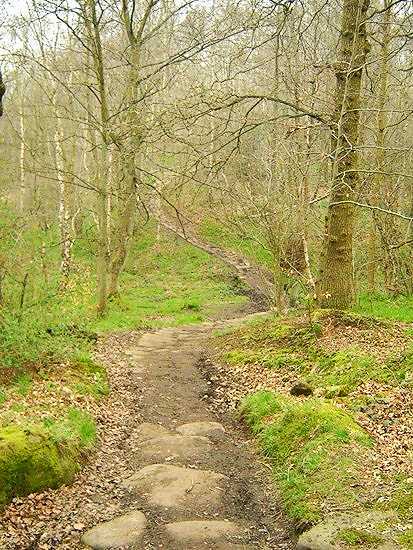 We were fortunate to find a seat along this track, that went to Curbar Wood, where we sat and enjoyed a snack and met a couple of local ladies who were walking their dogs. We had a very interesting 5 minutes or so chatting with them. They informed us that there were deer in the woods, probably escapees from the nearby Chatsworth Estate. However, despite being very quiet, as we continued through the trees we were disappointed not to see any. Maybe another time? 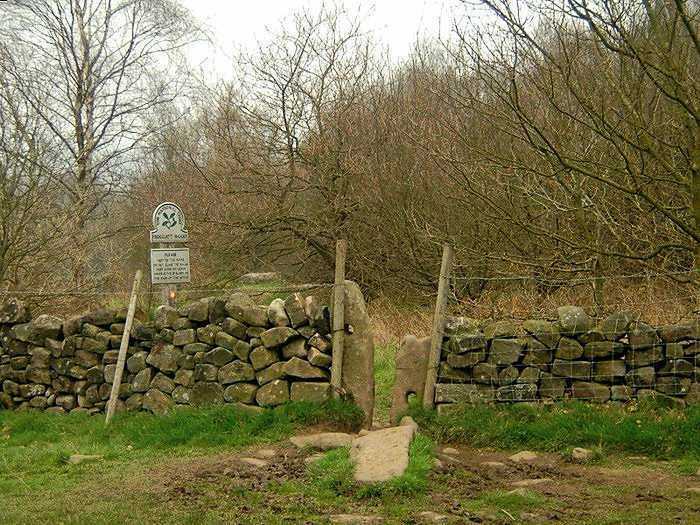 We left the wood just south of the Chequers Inn on the A625 and walked towards the pub, but before reaching it went left over one of the most difficult stiles of the day, which had a very big drop into the field. 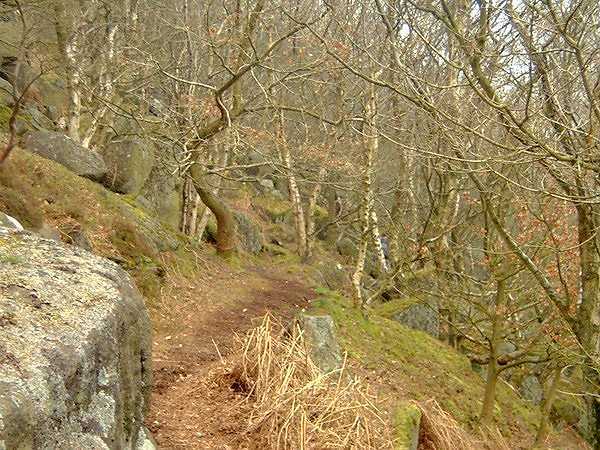 Having negotiated it we followed a track downhill to Froggatt. 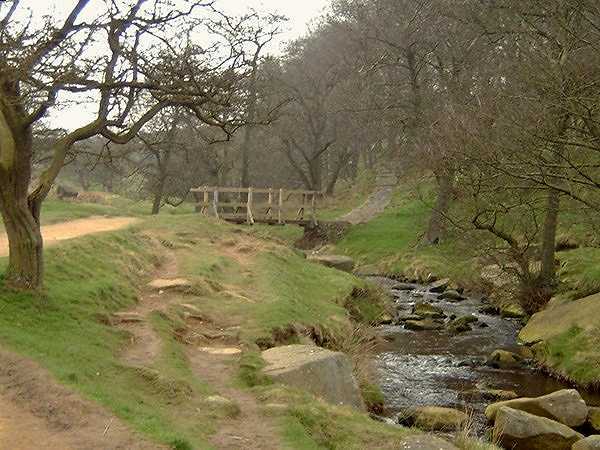 This was familiar territory to us as this path is part of the route of the Chatsworth Challenge, a walk which both Anne and I have completed. 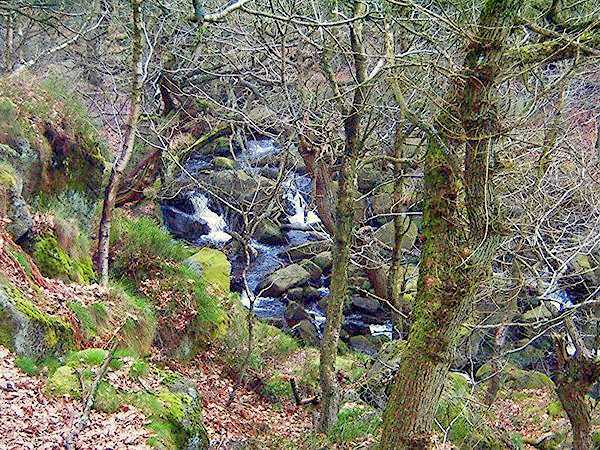 Having reached the road that goes through Froggatt we turned right and walked northwards and soon were walking close to the River Derwent on our left. 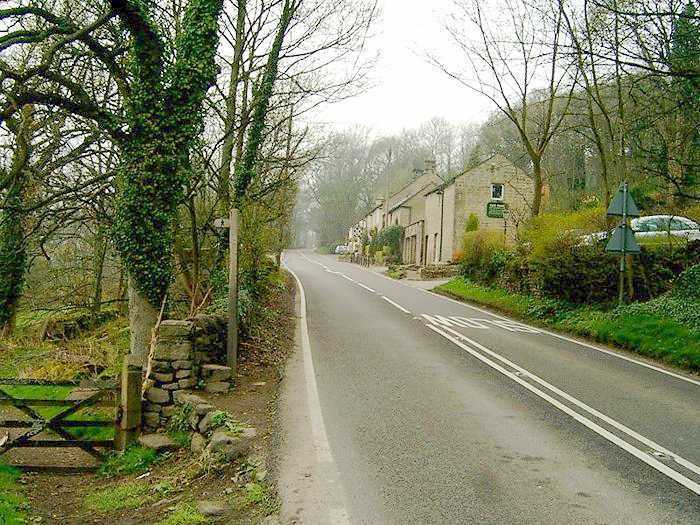 However, unlike the Chatsworth Challenge our route did not take us over the river bridge but continued through the village towards Grindleford. 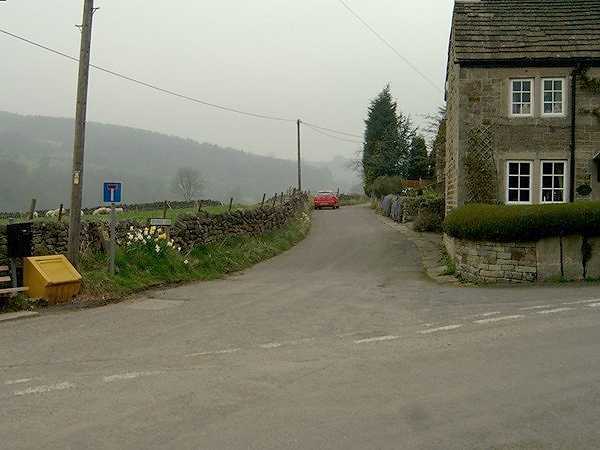 We left Froggatt via Spooner Lane. 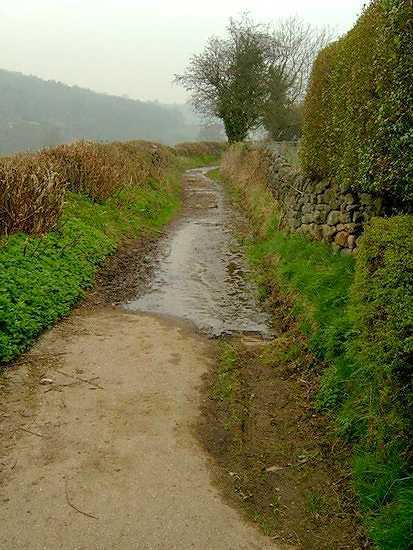 This thoroughfare starts with a tarmac surface which gets less good as the route get narrower until it is no more than an unsurfaced path between walls before it enters a field and more or less vanishes. The changing face of Spooner Lane. 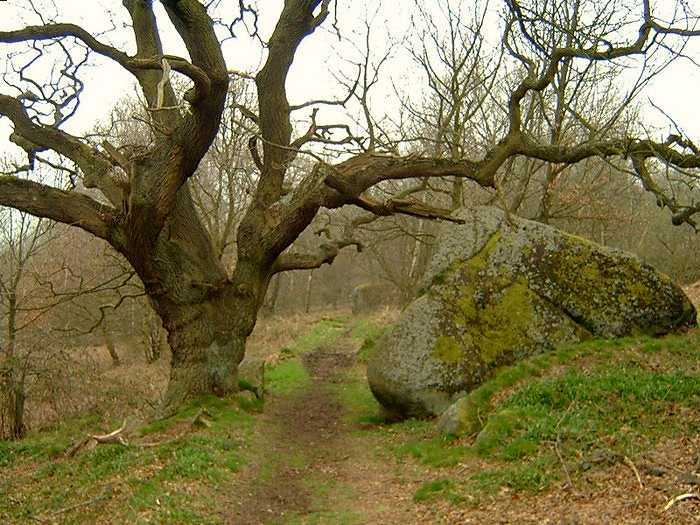 However, the directional signs were clear and we had no problem finding our way to Froggatt Wood the next location on our route. 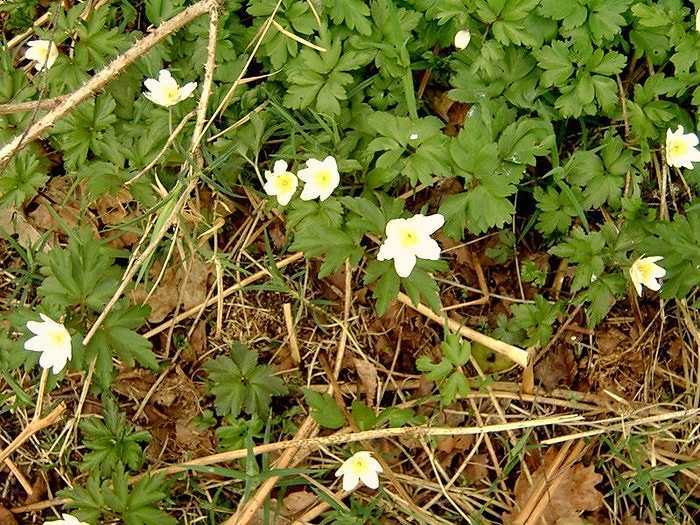 Like Curbar Wood it was beginning to come alive with wild flowers including Wood Anemones and Wood Sorrell. 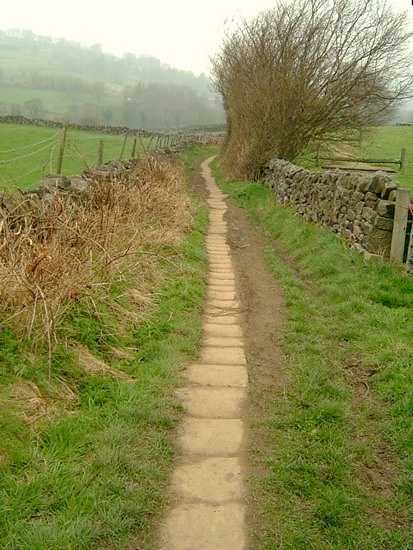 I had done this part of our route a couple of times previously, once in the current direction and the other on a cold wet day when I had undertaken the Grindleford Gallop with the “Boys” and we had walked this path from Grindleford at the beginning of the challenge. Needless to say my speed today was much reduced from then, particularly as Anne was enjoying the flora. 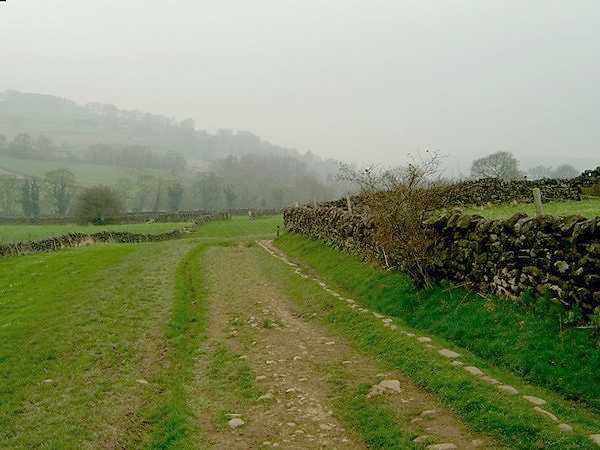 During this woody excursion we went from Froggatt Wood into Horse Hay Wood before we left the trees and, having crossed a stream, passed through a field of sheep before we came to the B6521 road by the bridge over the River Derwent at Grindleford. In reading this you may have realised that apart from the initial walk onto White Edge almost the entire walk had been on the flat or downhill so ahead of us now was an uphill “grind” back to our starting point. 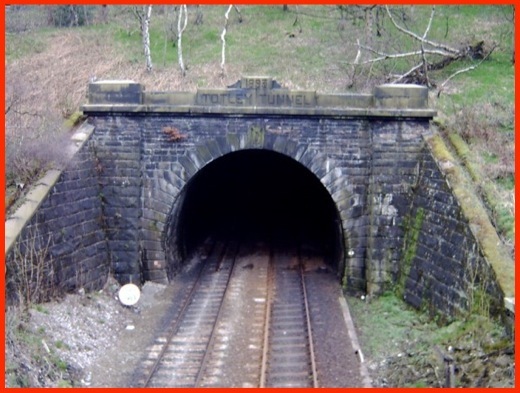 So it was uphill northwards along the B6521 for about a mile until we turned off left downhill towards Grindleford Railway Station. This was a very busy area. 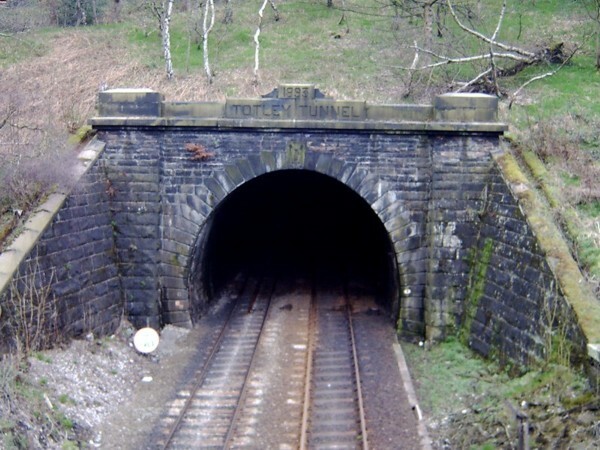 The road down to the station had almost every car parking space in use and the café adjacent to the station was very busy so we resisted the temptation to stop for a cup of tea or something a bit stronger and, having passed the end of Totley Tunnel, we turn right through a gateway into Padley Gorge. 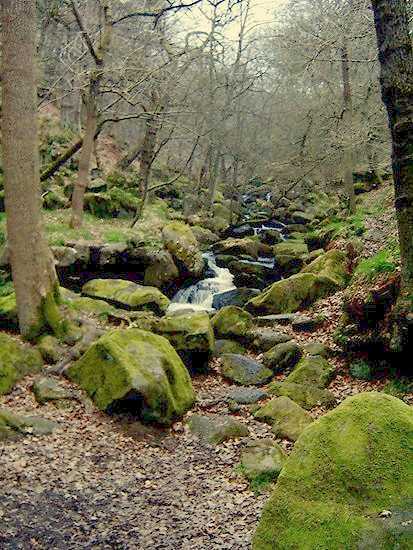 On previous visits to Padley Gorge I had always taken the path on the west side of Burbage Brook, which flows through the gorge. This time we decided to take the route on the brook’s east bank and cross to the other bank, via a bridge, a ¼ mile or so upstream. We certainly found this route over the tree and rock covered terrain more difficult than expected and it was very much a relief to reach the bridge. However, there was still a good way to go. 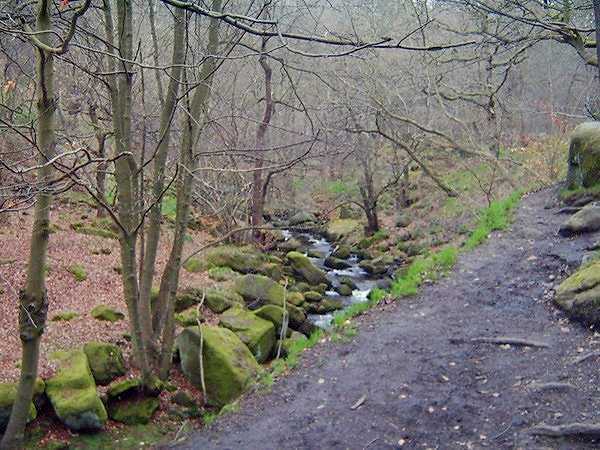 Having crossed Burbage Brook we took a very muddy ascending zig zag path to the main route through the gorge. 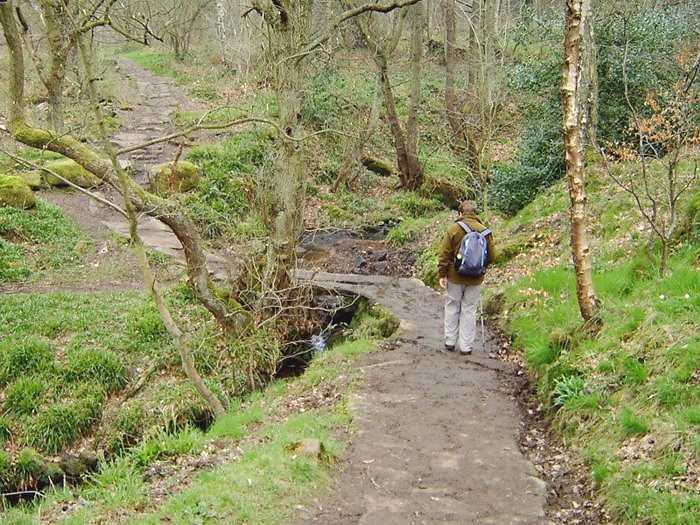 Once this was reached the walking was much easier along the main path, which gave us almost bird’s eye views through the trees to the brook below as it made its way, rushing over rocks, to meet up with the River Derwent just north of Grindleford Village. Twenty minutes later we were at the top of the gorge in more open country with views of Carl Wark and the moorland to the north. 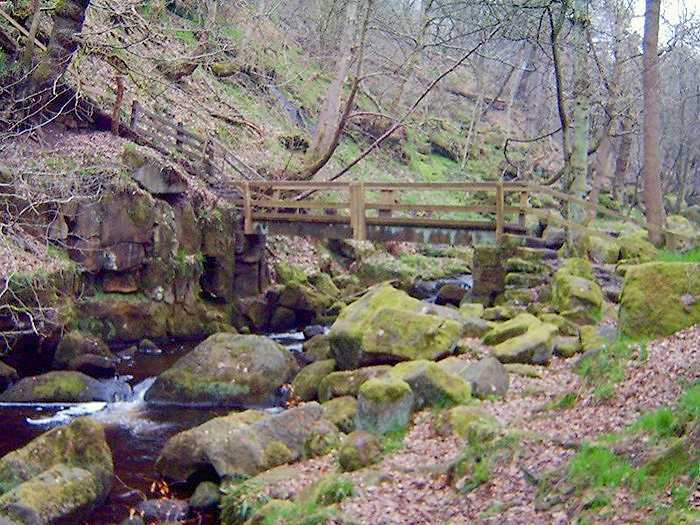 We continued to follow the west bank of the brook until, just before the A6187 Sheffield to Hathersage Road was reached, we crossed over a footbridge and took a path that would lead to our starting point. 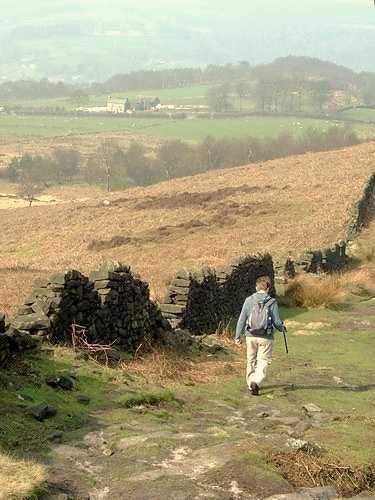 Although I estimate the walk only to be 10 or 11 miles it seemed much harder than our Stanage Walk the previous day - probably because the ascent at the end of the walk from Grindleford to our starting point at Fox House Inn was in excess of 600 feet. 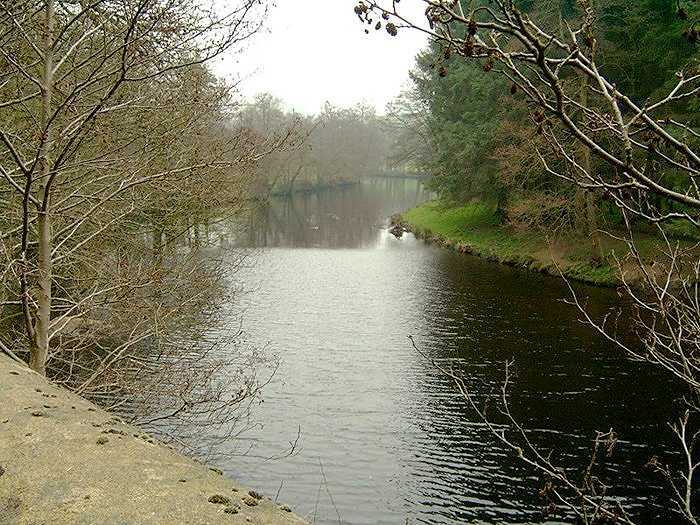 However, it had been an excellent walk showing so many aspects of the countryside of this area. 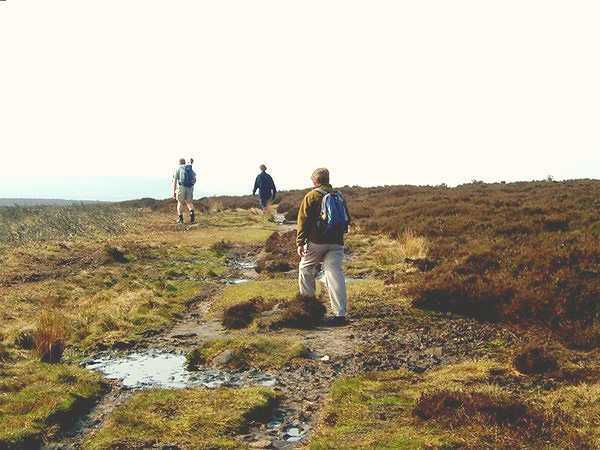 If you fancy trying this walk you will need the Ordnance Survey Explorer Map, 1:25000 Scale, for the Peak District – White Peak Area, No. OL24 which covers most of the walk. However, for the beginning and end of this walk, No.OL1 (Dark Peak Area) is desirable.